‘Green New Deal’ Suggests Welfare For Those ‘Unwilling To Work.’ Is That A Mistake? A “Green New Deal” FAQ page posted on Ocasio-Cortez’s congressional website says a “Green New Deal” Would guarantee “[e]conomic security to all who are unable or unwilling to work.” In other words, people who may not want to work. However, Ocasio-Cortez’s staff seemed to have taken the FAQ off their website as of Thursday afternoon. 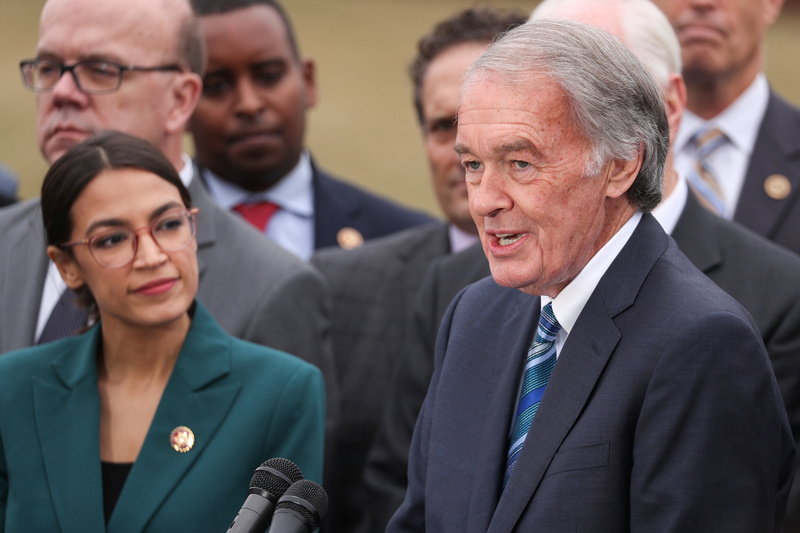 Ocasio-Cortez unveiled her “Green New Deal” resolution Thursday alongside Democratic Massachusetts Sen. Ed Markey, who introduced a companion bill in the Senate. Markey’s bill is co-sponsored by 2020 presidential contenders, including Cory Booker of New Jersey and Kamala Harris of California. Ocasio-Cortez said the House version had more than 60 co-sponsors, including Democratic Hawaii Rep. Tulsi Gabbard. The bill is unlikely to pass the House and has zero chance of passing the Senate. House Democratic leadership hasn’t lined up behind the “Green New Deal.” House Speaker Nancy Pelosi dismissed the resolution as a “suggestion” that would only be an option her party considered.